River Valley Internet Plans Expansion! 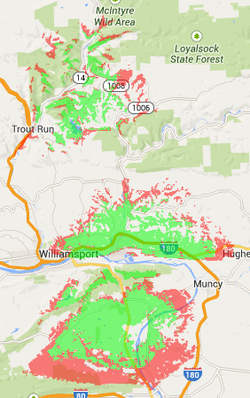 In addition to our existing coverage in Williamsport, Montoursville, Newberry and now South Williamsport, River Valley Internet is currently working on a county wide expansion project. The map at the left shows our current projected NEW coverage by late-summer. If you live within these areas (Trout Run, Bodines, Rose Valley, Montgomery, Elimsport, Watsontown, Picture Rocks) or the surrounding areas as shown by the red or green coverage on the map we may be coming to your backyard soon! Fill out the form below and we'll give you a call when service is available! We promise not to spam you or sell your contact information.